(1.Trace your template onto a piece of cardboard. (2. 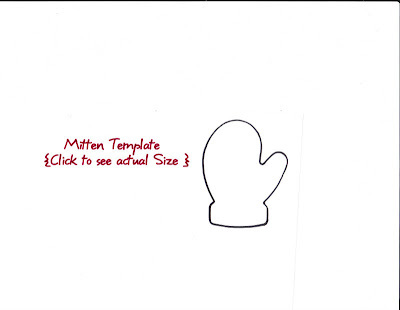 With your cardboard template trace out your wool mitten. (4. 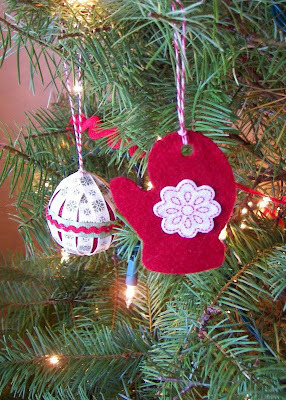 Embellish with: Felt Stickers ( I found these Martha Stewart felt stickers at Walmart ) or rick rack hot glued or sewn along the wrist, or felt words from Creative Cafe centered and either hot-glued or sewn onto the mitten, buttons, etc. (5. Punch hole on either the top or bottom of the mitten, which ever you prefer. (6. String with ribbon, embroidery floss, bakers twine, etc. Wha-la! Promise this is worlds fastest and easiest little ornament/something cute to tie on top of a present. Ever. i used the same idea (minus the hole punch and ribbon) to make mitten clips (via marthastewart.com). i'm using them to clip bags of holiday treats closed. soo cute Chelle. I love your ornament and the idea of putting it on a present too. 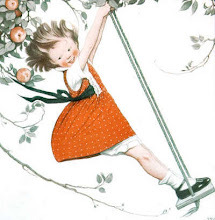 You know what would look so cute aswell.. the other mitten attached and slung over the tree branch.. or on the present with to: on one mit and from: on the other.. oh you are starting me with ideas now! I love this idea!! Very creative!